Like other integrations, you need to be a Company Admin in order to enable the Doorbell integration. With Doorbell installed on your website or in your mobile apps, users can quickly submit feedback to your team by clicking on the Doorbell widget and filling out a contact form. When Doorbell is connected to Front, your team can follow up with users about their feedback directly from Front. You can also view details about your user (like their browser version or location) in the Doorbell plugin directly next to the message. If you aren't a Doorbell customer already, you can sign up here. Doorbell has a two part set up process: syncing messages from Doorbell to Front, and adding the Doorbell plugin. Log into your Doorbell account. Open your application's setup page. Scroll down to the list of Integrations, then choose Front from the list. Click Connect to Front, then Authorize in the next screen to grant Doorbell access to send messages to your Front account. Choose the inbox where you want Doorbell messages to be sent from the dropdown menu. To create a separate inbox just for Doorbell messages, click the Create a new inbox link and name the new inbox. Then click Save. Feedback submitted to this Doorbell application will now arrive in your chosen inbox in Front. All Doorbell messages will be tagged "Doorbell" for easy identification. When you reply in Front, your message will be sent directly to the user who submitted the feedback and the conversation will be logged in Doorbell. Go into your Settings and select Integrations. Click on Doorbell. Click the Settings tab on the Doorbell integration page, turn the toggle on, and click Save. You can now display user information from Doorbell next to related messages in Front. Open the plugin panel by clicking on the arrow located on the top right corner of your Front app, and choose the Doorbell plugin from the dropdown menu. Log in using your Doorbell account credentials. When you click on a message sent to Front from Doorbell (you can identify these by the Doorbell tag), related details like the user's browser version or location will be displayed in the plugin for extra context on the user's feedback. 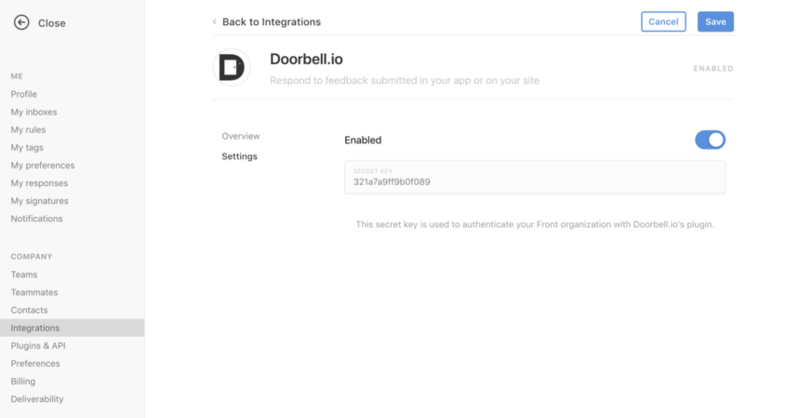 For more tips on using this integration and more detailed support, please review Doorbell's integration documentation here or reach out to the Doorbell support team!